The California Coastal Commission holds contests throughout the year to encourage the public to consider, visit, and care for the coast. 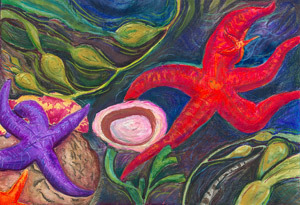 The Coastal Art & Poetry Contest is open to all California students in kindergarten through 12th grade, and is a chance for students to explore coastal themes and present them creatively. By encouraging youth to reflect on the beauty and spirit of California's beaches and ocean, we hope to inspire a greater sense of stewardship for these natural places. The contest deadline comes at the end of January. The Amateur Photography Contest seeks photographs that depict the coast and its myriad landscapes, resources and uses. Entrants are encouraged to submit photos in the following categories: the scenic coast, ways people use the coast, and coastal wildlife. Photographs that document coastal resources protected by Coastal Commission action, including public beaches or public accessways to beaches, agricultural land, or wetlands are especially encouraged. Entry deadline comes in the summer.